The greatest story ever sold? A declassified story brought to the big screen directed and starring Ben Affleck. Giving the political climate now I thought it was interesting this movie would be released but its a story that they felt needed to be told, and boy do they tell it. Argo opens with the political unrest in Iran. There's a lot of political commentary via voiceover about the US involvement in placing a "dictator" in power who then proceeded to treat the people terribly. After many years he was overthrown but anti-american sentiment was already pretty high and could only get worse. The conflict really goes nuts when the US Embassy in Tehran is taken over. In the chaos six Americans, a mixture of married couples and friends exit instead of waiting to be taken hostage and find refuge with the Canadian Ambassador, Ken Taylor played by Victor Garber and his wife. After hosting the 6 and hiding them when necessary he needs to get them out and the CIA is brought into the fold. Affleck play Tony Mendez, who after some consulting with his boss Jack O'Donnell (Bryan Cranston) decide to present the idea to get them out as a Canadian film crew. Its 1979, this is the time period that gave us films like Star Wars and Flash Gordon so the idea of needing an exotic location actually seems plausible. With the help of one of his close personal friends hollywood makeup artist John Chambers (John Goodman), They go out and get a producer (Alan Arkin), a script, an ad in Variety and all the things they need to make it seem like this movie is being made just in case someone in Iran does a background check. The movie is tense. You go in feeling like they are either not going to get the mission off the ground or pull it off, they run into roadblocks even before Tony heads to Iran, when they have to get things past the White House chief of staff Hamilton Jordan (Kyle Chandler). The 6 Americans you get to know them, you can see their restlessness the longer they are with the ambassador; see their fear when the release that getting caught is most certainly death and their hesitation to even go along with the plan. They weren't relatively close before their extended stay but their trust in each other grows. You still get the conflicts and you care about them. They aren't all likeable but you like them enough to care if they get out of this alive. It really didn't matter to me that I knew how the operation turned out, i was still drawn in from beginning to end. The postscript voiceover, and the side-by-side still images of the real events and the film portrayal really sells this movie. I give this movie a Full Price. I was completely engulfed in this movie and can't stop thinking about how much I liked it. This is a movie I know I will rent and watch again. 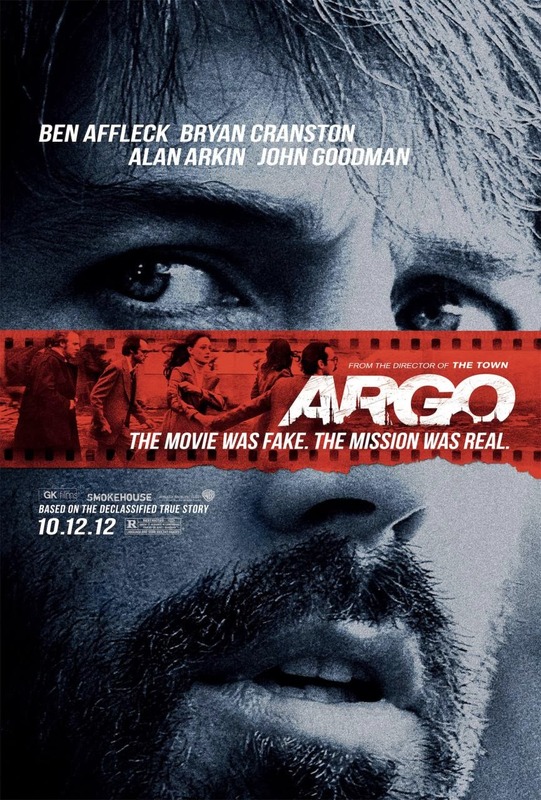 Argo is Rated R and opens October 12th.